Visitor Management – including pre-authorized visitors, ad-hoc visitors such as delivery persons etc. To get started, please procure an android tablet to be given to the security (any one in the society having an old tablet can donate :)) If there are multiple gates, one tablet per gate is required. Login to the web portal as a community admin and go to Gatekeeper->Attendance Devices in the left side menu and then click “Add Device”. 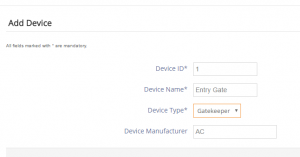 Complete the details and select “Device Type” as “Gatekeeper” and then click “Add”. Repeat this process for all the gates where you want to use Gatekeeper (you can always add more devices later at any point of time). Now on the tablet that has been procured, download and install Gatekeeper by ApnaComplex App from Google Play Store. Login into Gatekeeper using any id having community admin / security front office role. Choose a 4 digit pin after successful login. The App automatically syncs up all the service staff and member data from the ApnaComplex servers. As a first step, select “Maintenance Devices” (last icon on the Gatekeeper dashboard). You will get the list of Gatekeeper devices. Select the device. This configures the Gatekeeper to be used for Service Staff Movement Tracking. Now, click on Staff Entry / Staff Exit and you will see the list of Staff. You can now record entry/exit. For Visitor Tracking, you can click on “Visitor Entry” to create a new Visitor Pass and “Visitor Exit” to record the exit of the Visitor. To configure the list of fields to be captured for Visitor Entry, please go to Complex->Settings -> Gatekeeper Settings on the web portal as a Community Admin and change the default configuration to suit your society’s needs.